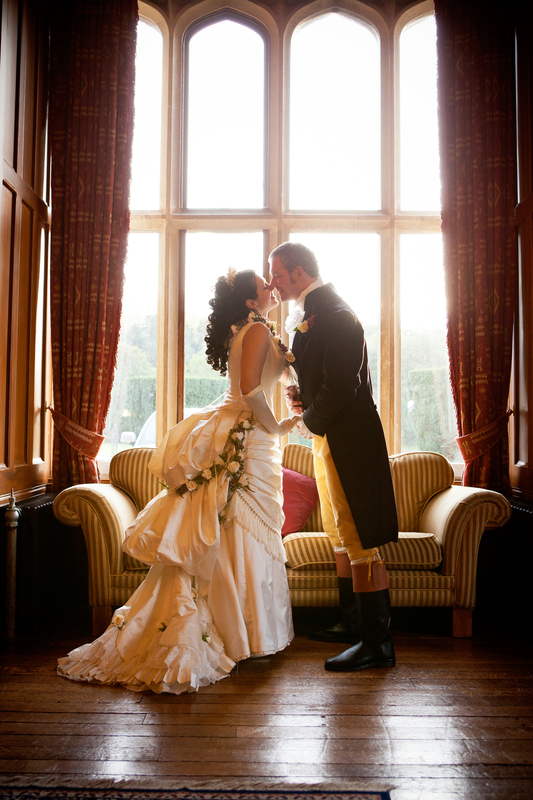 One thing was obvious from the beginning – although we both currently reside in Bedford, it was Devon and Somerset, especially the Quantocks Hills that we both love and spend a lot of our time on holidays, running, riding and hunting, and it went without saying that this would be the place where we want to say our vows. 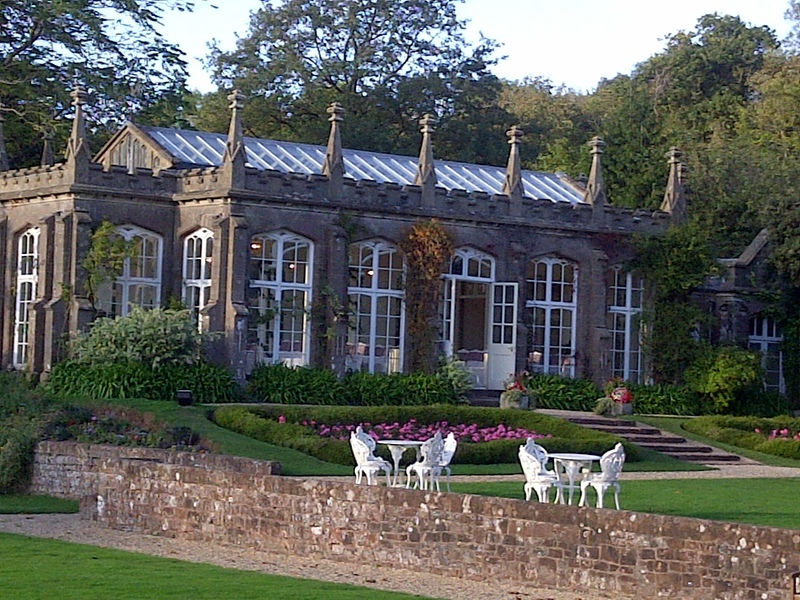 We had a look at a few venues in the area, but the moment we clasped our eyes on St. Audries, we knew this was it – a spectacular location, just off the Quantocks Hills, my favourite hunting grounds; a place full of character and charm with lovely interiors, luxurious rooms, all set within beautiful grounds. But could we ride there? 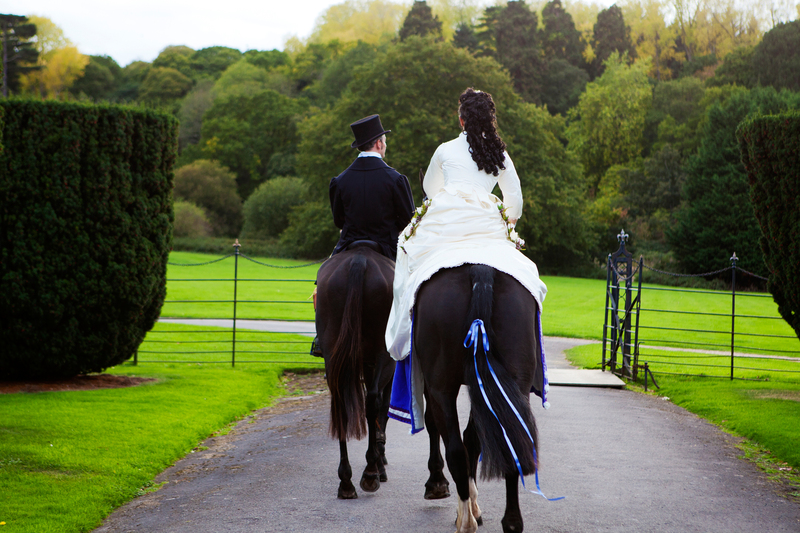 One call and we were elated – no problems with horse riding on the grounds! In a few days’ time the date was set, the deposit paid and we had 9 months to get ready. The day itself was – well, incredible. Busy too, but since we like busy, it suited us very well. I arrived a day earlier, and stayed at St. Audries for the night before the wedding – we actually booked the little cottage for my bridal party, but since the venue had a cancellation on that night, they very gracefully suggested that we stay in the main house, in our bedrooms, to avoid all the hassle of moving the next day. 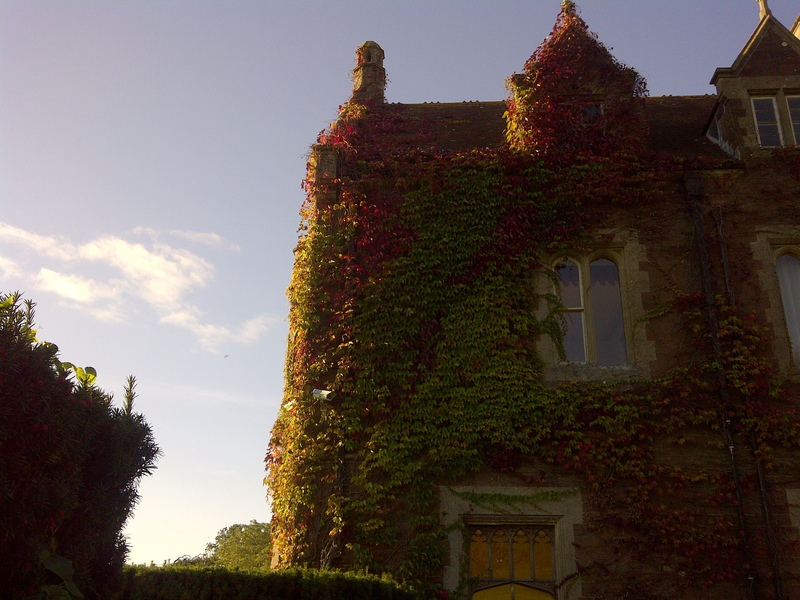 the venue the day before – simply sumptous in its autumnal array! 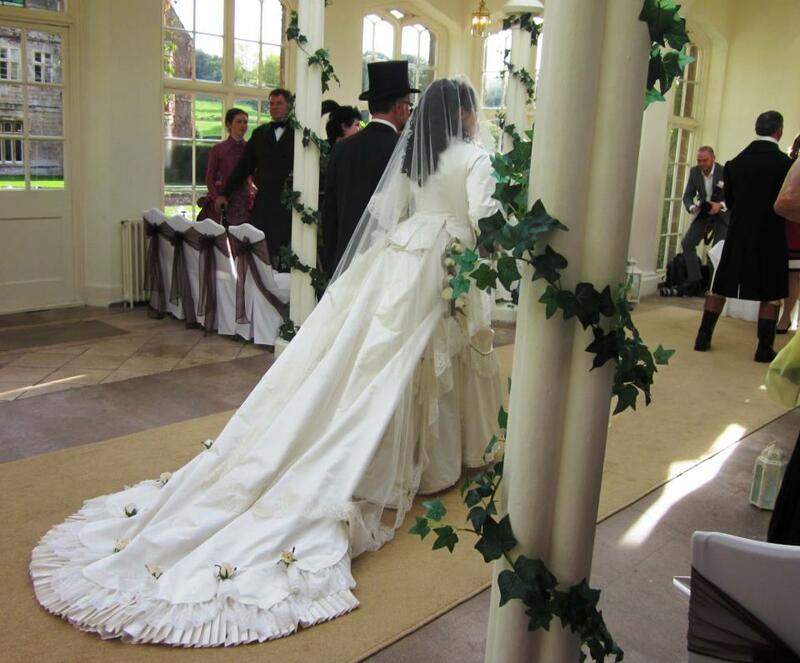 I arrived before my bridesmaids (having left my husband to be with friends near Tiverton) and enjoyed a leisurely walk around the house – and a last minute sewing session in the bridal changing room. 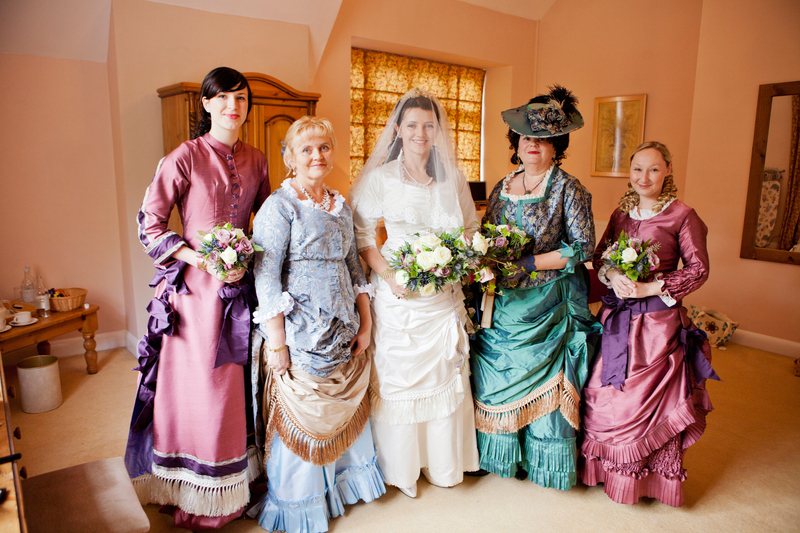 As a professional costumier, I made my own wedding dress (based on 1883 Victorian fashions) and made my mother’s, and bridesmaid’s outfits too – altogether 5 Victorian toilettes. Once the bridesmaids arrived (a bit intimidated by the large, quiet house), we got changed and went out for a dinner in a nearby pub. 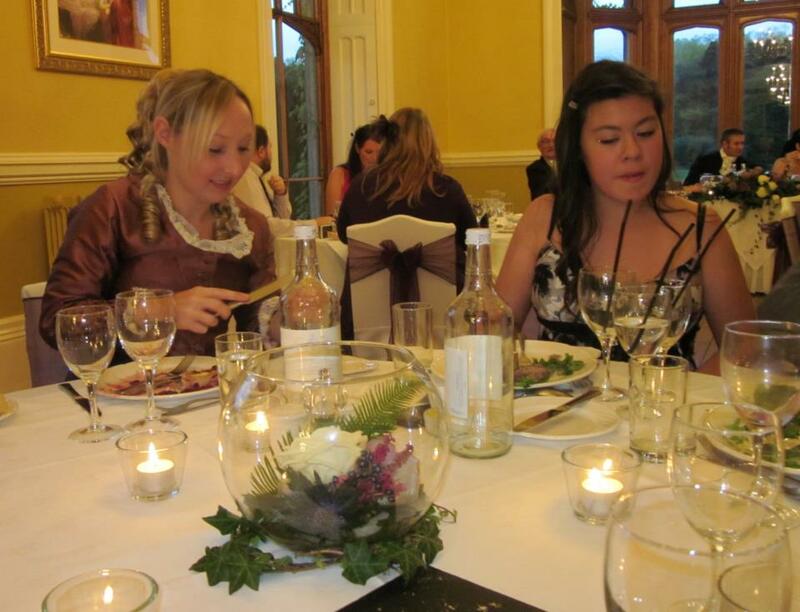 As a hen night theme we chose ‘brides in different cultures’, so, as a result, we caused a bit of a stir at the pub – not every day do they have girls dressed as Indian, Pakistani, Russian and Chinese brides coming over for a meal and a laugh! After the meal, we retired back to the house, carried out the last preparations (pressing the skirts, last minute stitching, etc) and then slept the night away in our lavish bedrooms. 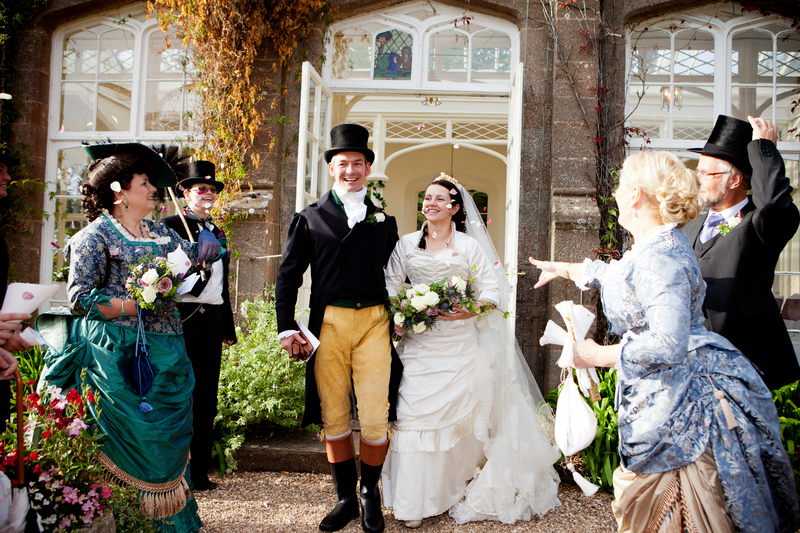 I must admit that I did sneak in outside, and went for a walk around – and practiced my walking down the aisle in the magical, lantern-lit orangery. Breakfast out of the way, moods soaring – time to kit up and get to the meet; we had arranged with the Quantocks Stag Hunt to host a wedding hunt-meet at the nearby Staple Farm. 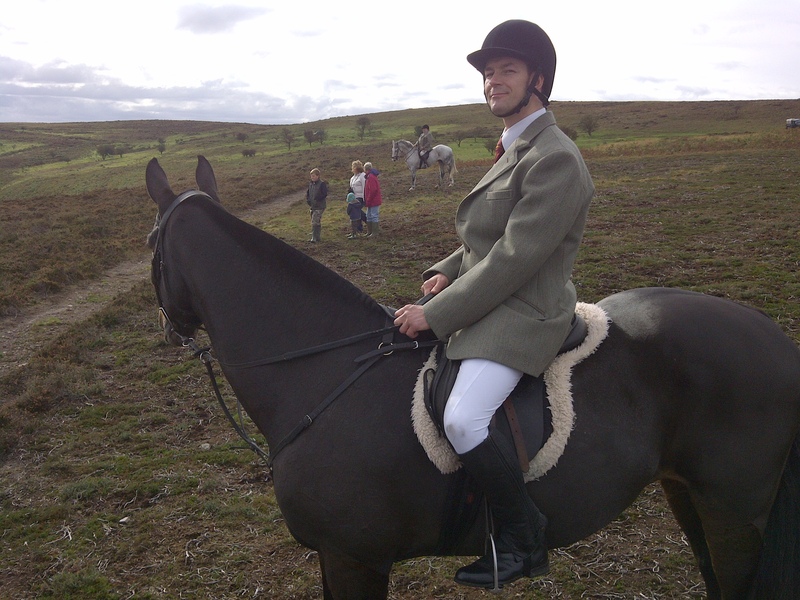 All geared up, I met my future husband at the meet, all beaming and looking very smart in his new hunting gear. The turnout was excellent, and for my part of the family, who travelled all the way from Poland, it was an amazing experience – there is no more hunting there, so being at a proper meet was a real treat. Once the port was drunk and snacks consumed, I left my matron of honour to get things organized and to make sure all the quests are established in their respective bedrooms. As it turned out, she didn’t have much to do and the house manager on the day had all things firmly in hand and dealt with everything admirably well – when it turned out that we had one guest extra, a spare bedroom for him was found in minutes. 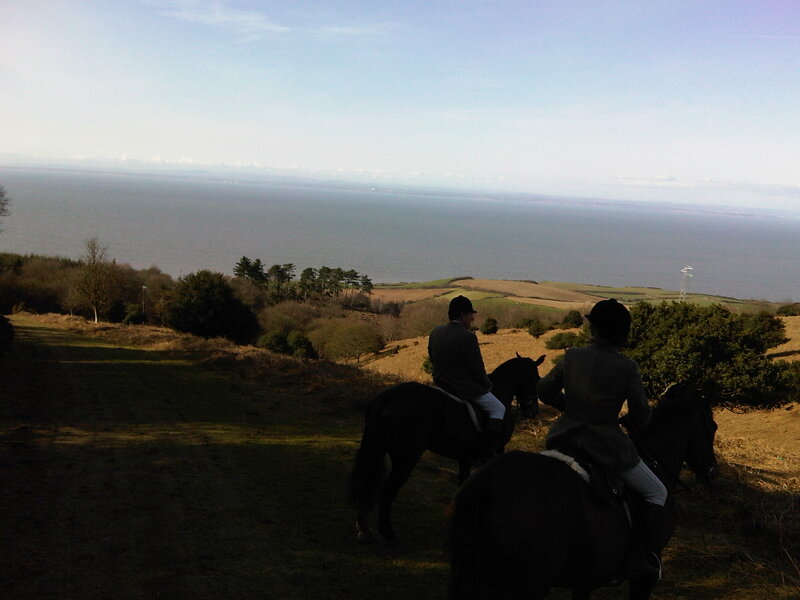 And so, when Lucas and I, together with our hunting guests were riding on the Quantocks, the other guests were relaxed in the house, enjoying walks, drinks and canapés. In the meantime, the hunt was going well. I have hunted more or less regularly over the last few years, but for Lucas it was the first time – but as you’ll see from the pictures, he was enjoying it immensely. Lucas on Ryan, looking, as always, very smug. Everything was going fine, until about 1.30. 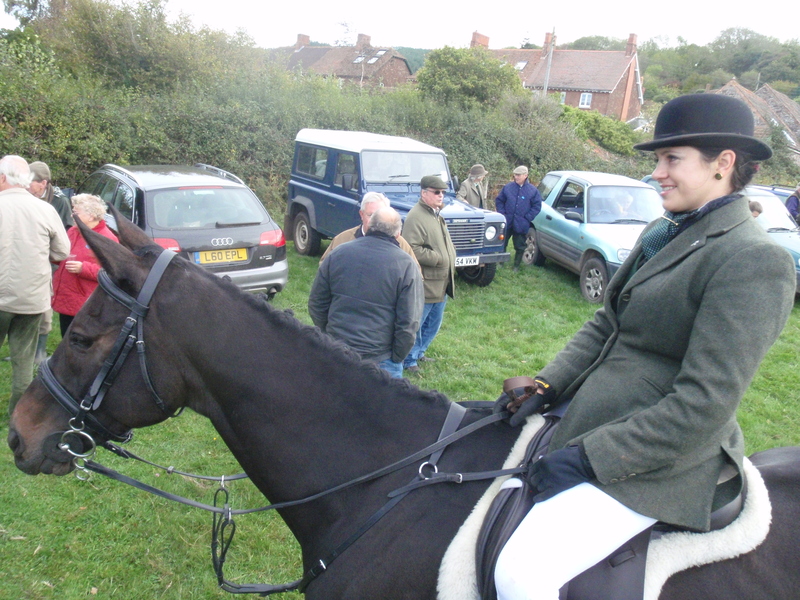 This was the time when we planned to leave the hunting to go on without us – we would call for the lorry to pick us up, so that both we and the horses could have a wash and change for the ceremony. Alas, when we reached for our phones it turned out there was no reception. Not a bar, nothing, zero, nada. And we were miles and miles away, in the middle of nowhere. There was only one thing left to do: ride in the direction of St. Audries in hope that we could stumble either on a patch of reception where one of us could use the phone, or upon some hunt-followers who would be able to give us a lift. After about half an hour, we struck lucky – we came across the hunt staff in a 4×4. They got on the horses, we got into the 4×4 – and we were on our way. As a consequence, we were about an hour behind schedule. 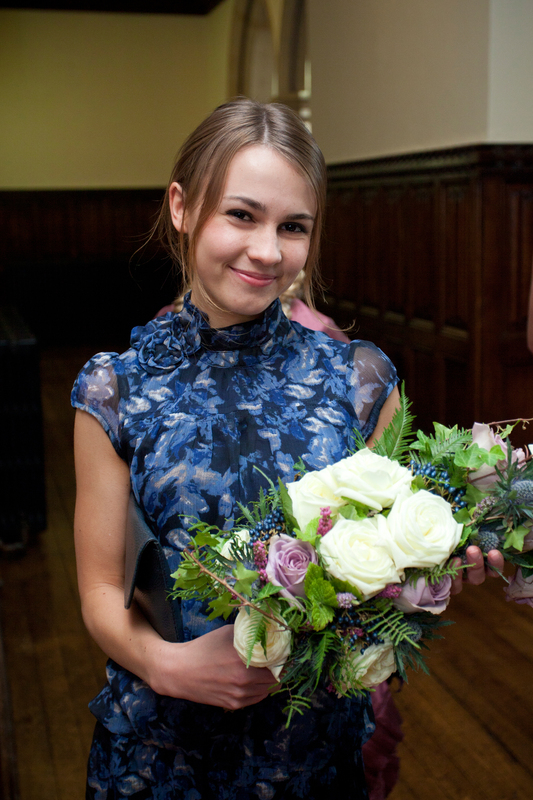 I had about half an hour to make sure the bridesmaids, my mother, etc, were all kitted up, then to have a short bath (made even shorter through the discovery that Jacuzzi and bath foam work surprisingly well together…) and then to get changed myself. 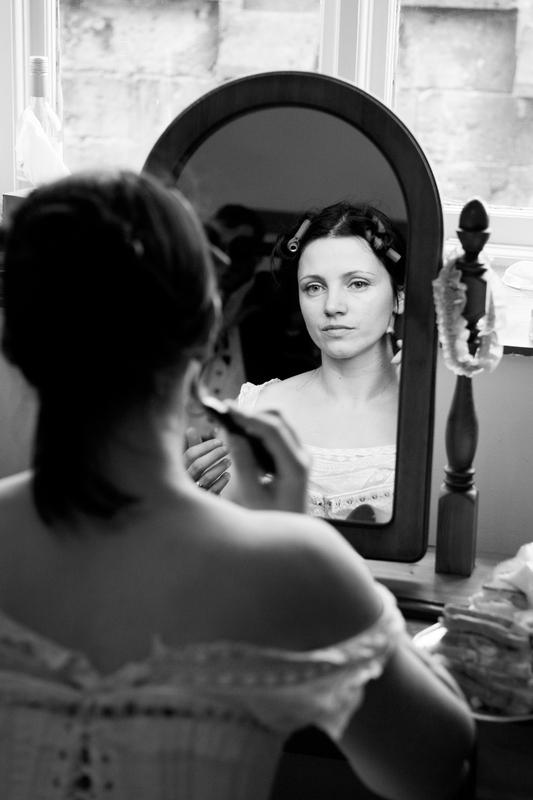 By the time I got to the changing room (leaving Lucas on the floor of our bridal suite, stitching a button back onto his breeches…), the photographer and the videographer were waiting, eager to start shooting the preparation of the bride. I dare say they were disappointed, as the whole preparation lasted about 10 minutes. Petticoats and corset on, two hot rollers on. Wipe any mud from hunting, realize that the makeup I did in the morning was still OK, just needed a touch of powder. Rollers out, hair in the bun, clip on the extensions and style them – 2 minutes work. Then on went the bustles, skirts, overskirts, train, corset covers and bodice. 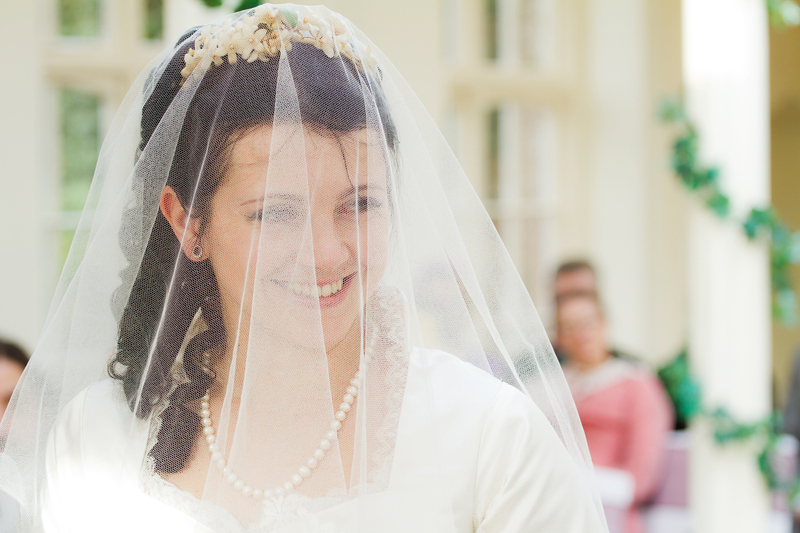 The tiara and the veil were the last. Ready in about 5 minutes, with all the bridal party waiting. Success! The house organization was impeccable – all the quests were already in the orangery, seated. My father was waiting, as was the registrar, for a short chat beforehand, and off we went. My most profound memory from these moments was that I simply couldn’t stop grinning. Try as I might, the grin was there, glued onto my face and no attempts of serene grace and charm would remove the thing. Oh well, could have been tears I suppose, so happy to contend myself with the grin. Off we walked, myself screened from the inquisitive glances of the guests by a huge bridal umbrella. At the orangery, the bridesmaids went in first, to the funky tune of: ‘Here Come the Girls’ getting lots of laughs from everybody. My turn. The ceremony was simple, straightforward and joyous, with two humorous readings by me and my matron of honour, with Lucas’ reading providing a deeper and more serious note to sustain some gravity of the occasion. Again, please note – the grin was still there. But by that time Lucas was grinning nonstop too, so it was fine. The ceremony over, we walked out to the shower of real rose petal confetti , hunter’s horn blazing and a rather unorthodox choice of music (‘Everybody was Kung Fu fighting’ – since we met at our Kung Fu club in Bedford, and still train there, it was only appropriate to incorporate the theme into the day somewhere). 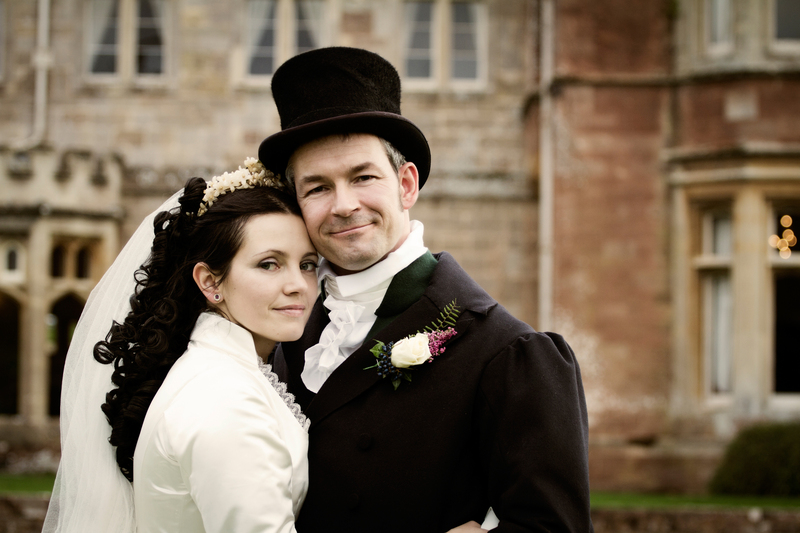 We were greeted and congratulated by a friend of ours who is also a professional chimney sweep – in her full regalia, it is considered to be very lucky to pass good wishes to the newlyweds. walking out – into the sunshine! Outside, the weather improved – we actually had some warm rays of sunshine peeping thorough the orangery windows during the ceremony, and when we were outside we had both sun and clouds,; good conditions for some excellent photos – so Phil from Lensmonkey Photography was hard at work trying to get a few nice poses out of us. circulating in style, Ryan and Punchy on their best behaviour too! We walked over to the main entrance, where our horses were waiting for us. Punchy, a lovely thoroughbred I rode earlier on was all cleaned up and ready for Lucas, and Ryan, was all kitted up with a side saddle and a decorative cloth (to protect the skirts) for me. We walked the horses around, chatting with the guests and family, and trying to calm down the owner of the horses – (since the horse I was supposed to ride aside had suffered an injury two weeks earlier, we opted for one of the local horses and that was only his second time aside). and off we go, leaving quietly, before breaking into a nice canter outside! 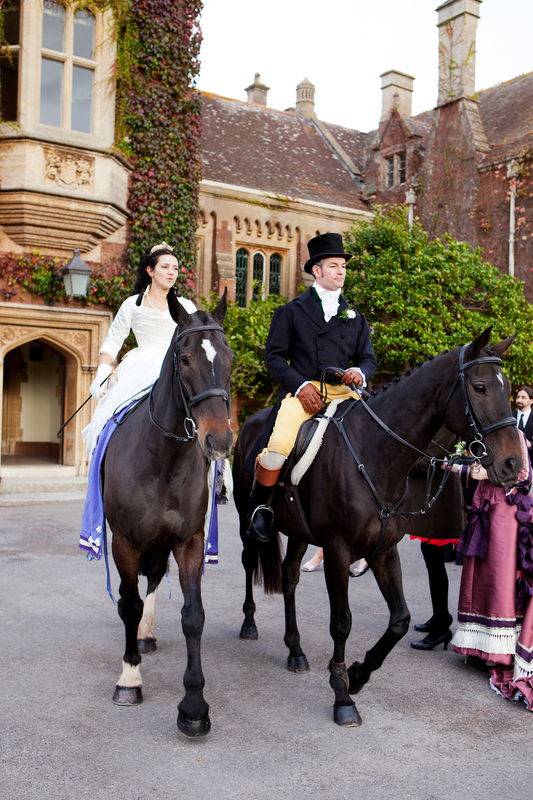 A quick change before dinner – I swapped the afternoon bodice of my outfit for the evening one, and bustled-up the train so that it was easier to walk and to dance in, and Lucas changed his buckskin breeches and riding boots into proper Victorian trousers and more sensible shoes. A few more photos in the lovely library, chatting to family and friends and shortly it was time to get to the dining room. 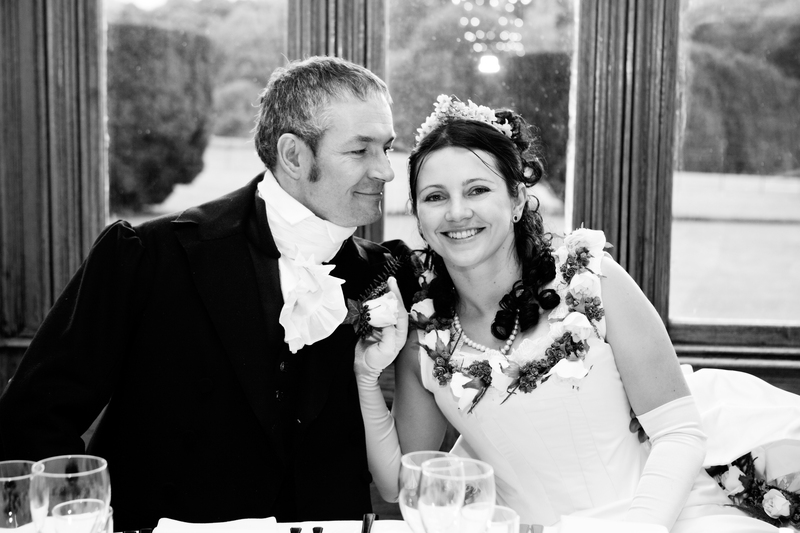 A quick note – this is usually a traditional time of accepting presents etc – but we opted for the convenience of a ‘Buy Our Honeymoon’ service, so our guests gad already given us the best gift of all – the chance to spend our honeymoon in a lovely location, doing the things we enjoy. By that time, I must admit that I was rather hungry – my last meal had been a snack at the meet so I, and no doubt many others, were very much looking forward to the anticipated feast. Speeches – with lots of humour and a bit of embarrassment (especially for my stepfather, bless him, when he started talking about my first boyfriend and I promptly corrected him, that he was by no means the first, probably utterly destroying the poor man’s faith in my innocent youthful conduct…) Lucas’s best man was his father – and that arrangement resulted in an unusual and a touching speech, very different from the standard ones. 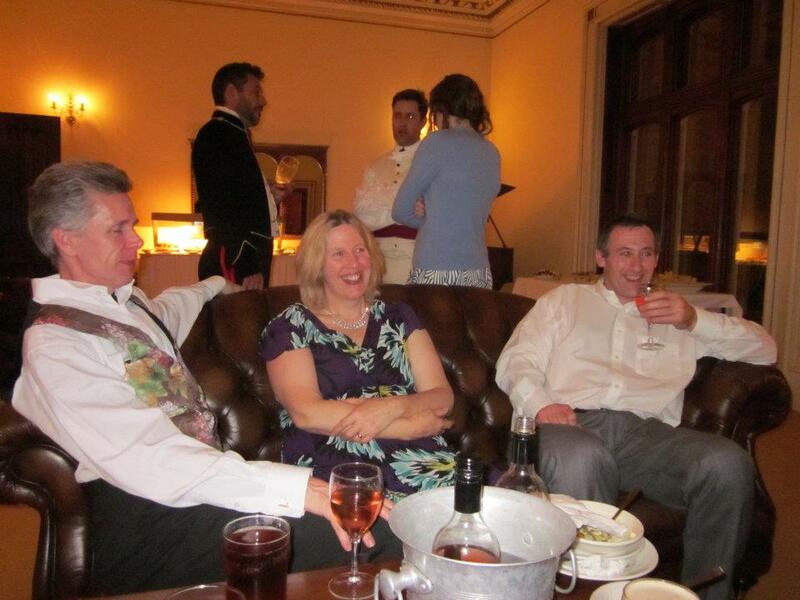 Lucas said a word, and I said a few too, (no way I was being excluded from the fun on my own wedding day! Appetites sated, we cut the cake (a mouth-watering Autumn berry Pavlova, provided by the venue) and proceeded to the hall for the dancing part of the evening. 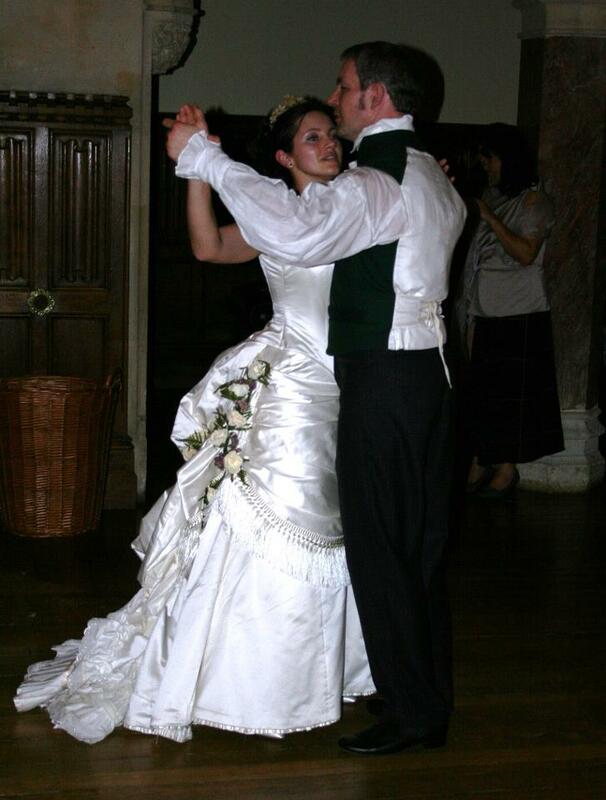 Our first dance was a Viennese waltz, danced to the ‘Voices of Spring’. Half way through the guests joined us (it was a very, very long tune…) and we all swayed away, as many of them had attended the dancing practice we organized for our guests a month earlier. 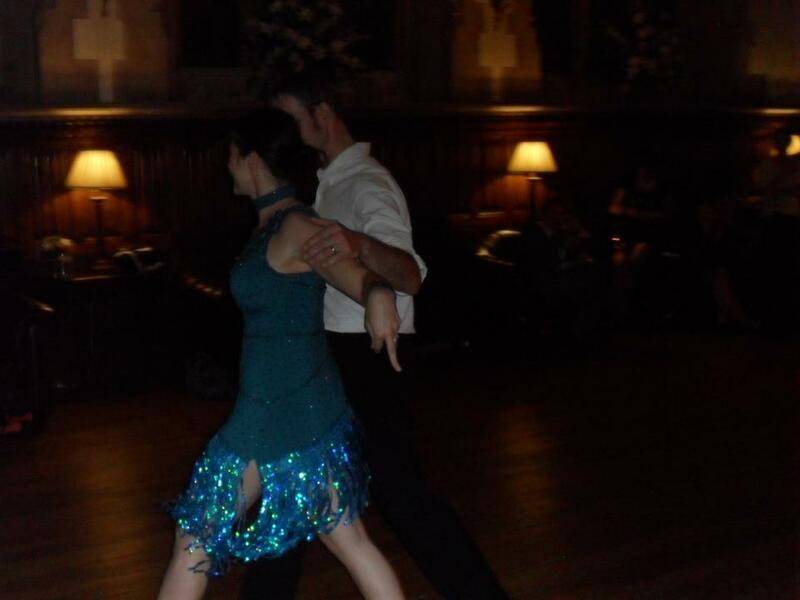 The Waltz was followed by the traditional Polish dance, the Polonaise – it is traditionally danced to open balls and proms and is a perfect way to get everybody onto the dance floor – it is a walking dance and no experience is needed as all you need to do is to follow the couple ahead. 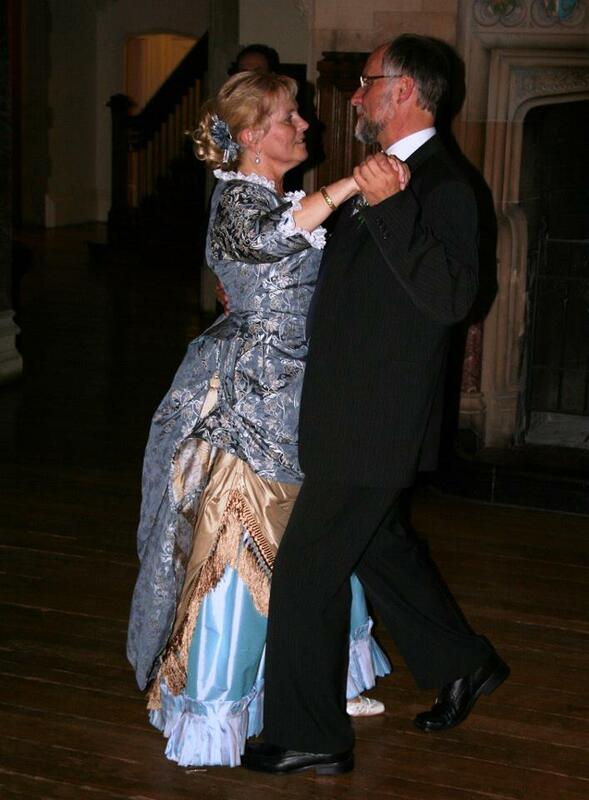 The Polonaise had its desired effect and once on the dance floor people joined in the next few traditional tunes – we had a few slow waltzes, quickstep, another Viennese, and even a spirited polka. The in-house DJ was great – I had prepared lists of songs and tunes that were to be played, and he didn’t mind it at all and was happy to get the list started in all the right moments. 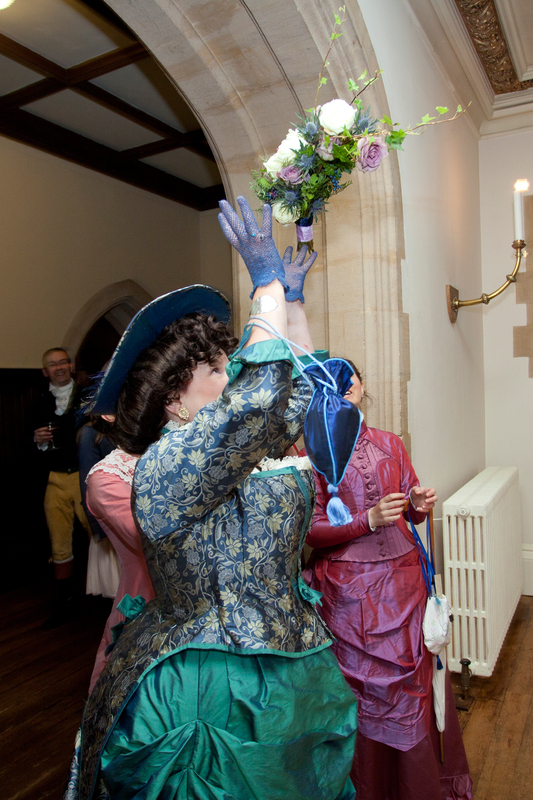 The Victorian part of the evening ended at about 9, when a hot buffet and the wedding cake was served – the interlude was utilised by the costumed guests for removing corsets, bloomers and bustles and getting into more modern attire. the evening attire in s steamy cha cha! We started the second part of the evening with a steamy cha cha (danced to ‘Sway’) and after that some very eclectic music followed – Latin rhythms mixed with pop and rock tunes kept us on the dance floor till midnight – though not a lot of guests kept our pace – mostly due to the fact that the allure of the buffet and bar in the neighbouring rooms was too strong. Not surprisingly I must admit – the buffet was great and the Pavlova was a truly inspired choice – light and fruity but not too sweet, it worked perfectly! Just after midnight even we were getting tired. The whole party was wrapped up smoothly and we got to our lovely bridal suite amidst cheers and leery smiles. Next morning breakfast was a lavish affair, with a growing demand for those already famous croissants J. We said our goodbyes, packed up (many people were leaving with a generous dollop of the Pavlova cake – we took some too, and with the addition of more berries it made a lovely Eaton mess in the afternoon. It was a sad moment, leaving the venue after such a spectacular and unforgettable day – but we knew we would be back at some point, in the worst case I would be waving at it from the Quantocks during one of our hunting days there. my new husband with his new in-laws, the day after! 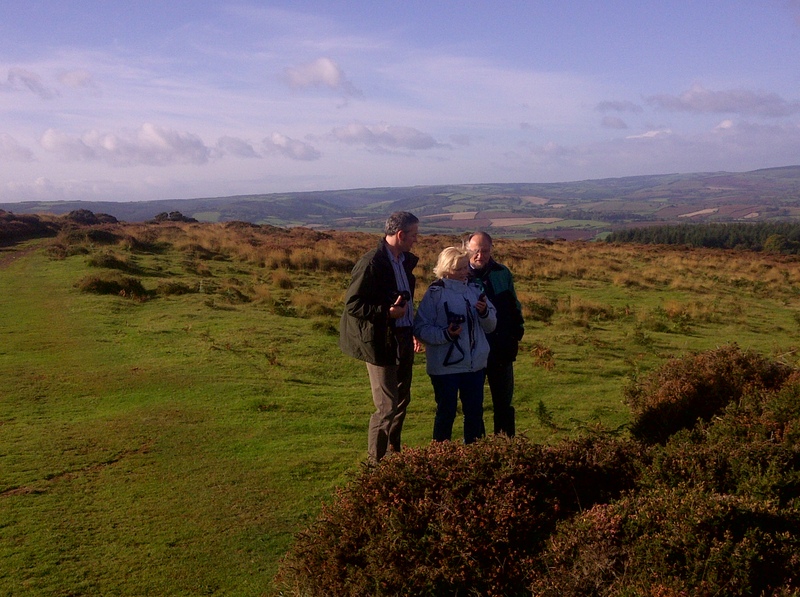 We did manage a nice walk on the hills that day, together with my parents, and then a quick visit to Dave and Ellen who were providing the horses and who also helped by arranging the wedding meet in the morning. We thanked them and the horses and were on our way, getting my parents to the airport. This is amazing. I am drooling all over my phone while looking at this!!!! Your video’s made me cry. You looked perfectly beautiful, your husband so handsome. Everything out of a dream and lots of laughter. Thank you so much for sharing it with us. I spent all the night watching your tutorials and wedding day notes/videos. I am completely enthralled….better than any novel! Thank you so very much for sharing. I wish you and your husband EVERY happiness. Simply gorgeous. It’s like you two have managed to make the purest fantasy of a child come true. I truly wish your love is forever.